Thank you Bradford for voting us the Best Dentist in Bradford for the 7th Consecutive Year! 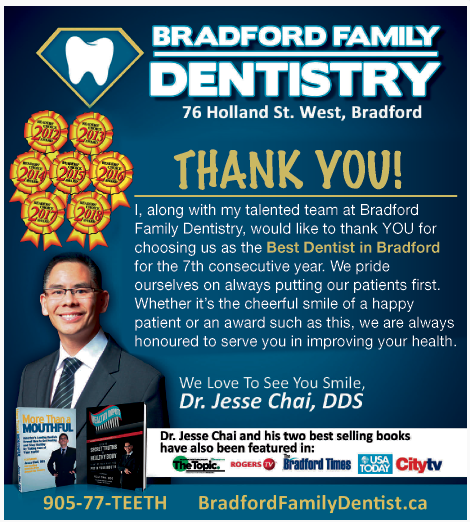 Dr. Jess Chai and the Bradford Family Dentistry Team would like to sincerely thank each and every patient that voted for us. Our patients are why we do what we do each and every day! Our goal is to provide exceptional dental care for the whole family in an environment that’s comfortable, reduces anxiety, and is a lot of fun. Great dentist office, fun themed rooms for everyone. Friendly staff, that do a good job. 5 stars!! My family loves coming for our visits with Dr Chai and the dental assistants!! We always have fun and enjoy the waiting room and are made very comfortable with our appointments, awesome job always! Are you ready to experience the best dentist in Bradford? We’d love to be your family dentist. Book an appointment or come in for a tour of the office.